Crocodile Games - Message: Two weeks to go before the start of the Croc Kickstarter! Posted By Topic » Two weeks to go before the start of the Croc Kickstarter! Two weeks to go before the start of the Croc Kickstarter! 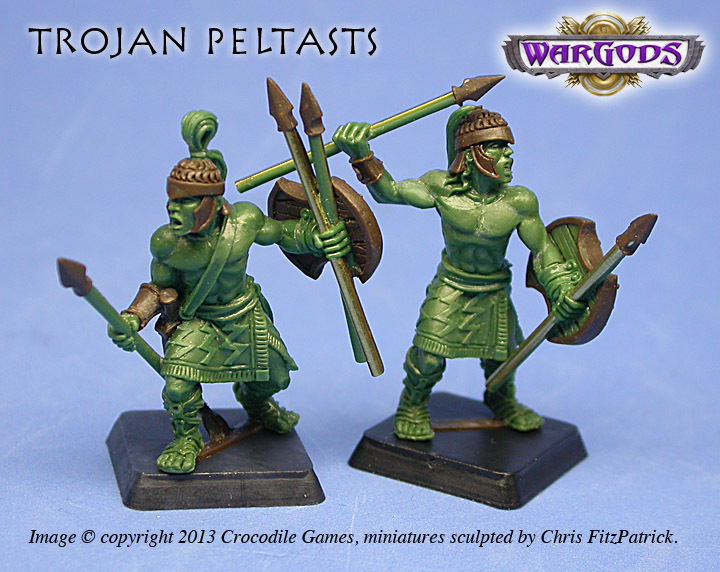 Today’s update – two Trojan Peltasts, sculpted by Chris FitzPatrick. These minis are going to be part of the upcoming Trojan Warband. If you like them please share the update with your friends and help us spread the word! Will there be kick starter exclusives or will it be the whole range that will be for sale to the public later on? If we can make it to some of our planned stretch goals we will have some special miniatures that will be exclusive to the Kickstarter program. But the basic funding goals are miniatures that will become a part of the ongoing range. I really hope we'll be able to make it to some of the strech goals -- if we can get to these, it is a real win/win for everyone -- we can make a bigger, better book and miniature range right away, and our warband backers all get extra miniatures, making their investment even better. We have some cool stuff planned! Can't see if this has already been asked but will there be the option to get Aeygptus models as addons? or the other released olympus models? When the program starts it will be for just the new Olympus stuff. We're trying to keep the program as simple as possible. Spartans and Mycenaeans could be swapped in, if someone wanted them instead of the Trojans. We'll probably add the Minotaurs and Satyrs as 'add ons' too, as I expect there would be a fair interest in them for players building warbands from scratch. Theoretically, anything can be added as add-ons, it would just get confusing when it came to fulfillment. I hope the titans get a little love. Would be great to see the rumoured conversion pack for their mutations! @ hazpak: Nail = Head. Hopefully there will be some Titan stretch goals allowing the warband to be more versatile, that would be super cool. Though, I do think the Demigods, Trojans, and Amazons should be a first priority. I feel the same way. The stuff with priority are the Demigods, Trojans, and then the Amazons, as I already have a lot of these models completed. If we can get these (and the book) all funded quickly, we'll start adding new stuff as we raise enough funds to produce them. I'd love to unleash Ben Siens on another batch of Titans! We are getting close, I am checking this forum repeatedly each day looking for even more wonderful preview stuff - but obviously we will see everything shortly - so, can you gestimate when the actual Kickstarter postings will appear? Saturday the 1st? Sunday the 2nd? later? sooner? sorry to nag, but I can hardly wait! We're adding the final touches to the project now. Once we submit it, it has to be approved, and the time on that is not really specified. We're hoping to go live Saturday though. We're going to post another teaser mini tonight, probably late! Thanks a lot to all the guys who have been sharing the stories on Facebook and other websites and forums! Please keep it up!